Ellie joined Three Rivers in July 2017 having previously worked in retail. Ellie always wanted to work with animals and enjoys being part of reception. Ellie has 2 dogs called Daisy and Belle who she loves very much. 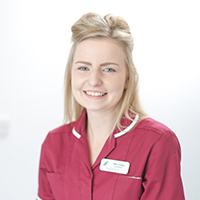 In her spare time Ellie enjoys socialising with friends and spending time with her family.